Well I am well and truly onto the backstitch. One colour is all done. 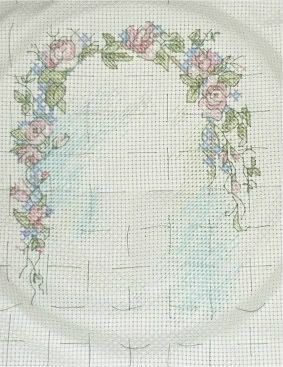 Actually all the backstitch around the flowers and leaves is done, now the only parts are the words and the design of the 2 people. I love watching this come together. Anyway I took my entry into the Ekka on Tuesday but I have to wait a month to find out whether I've won. That was the Land In Sight. I also took my form up today to the local show, to hand it in. I'm putting the frogs and the AOYs in there. It is so exciting. That show is next weekend the 23rd and 24th of July so I don't have to wait as long to find out. I will make sure I take my camera and take lots and lots of pictures!